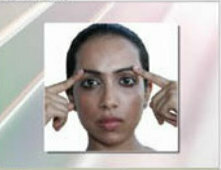 Facial Exercises For Men and Women, Get A Lifted Face Without Surgery. Facial exercises, for both men and women can takes years off your aging face giving you a tighter smoother complexion, sculpted face and fewer wrinkles. 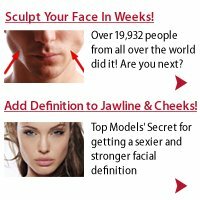 sculpted face & chiseled jaw line, a no surgery face lift. The Overall Elasticity And Health Of Our Skin Depends Greatly On The Underlying Support Of Our Facial Muscles. Our face is one of, if not the very first sign that gives away our age. When our face muscles lose firmness and tone our skin becomes wrinkled and saggy. Do you miss that chiseled jaw line and sculpted face you had back in the day when your facial muscles, jowls and neck muscles were firm, tight and strong? You can get that sculpted tighter lifted face and get rid of your eye bags and wrinkles, droopy eye lids, thinning lips, wrinkles around your lips, sagging jaw line (jowls) and double chin. Anti aging facial exercises will let you achieve that sculpted, firm, tighter and lifted face, giving into a smoother, stronger and chiseled face; building your face muscle and supporting your skin. 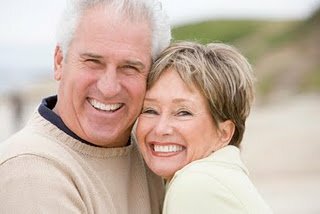 As we age, our face muscles are just like any other muscle in our body, if not exercised they become weak, lose tone and firmness and start sagging. And, then our complexion becomes wrinkled, loose and saggy; making us look old! More Lifted, Firm And Fewer Wrinkles! Most of us are striving to keep our youthful look, but we over look the importance and benefits of exercising our neck and face muscles. We tend to turn to cosmetic surgery and expensive cosmetic products to fight the aging process. HOWEVER, facial exercises are the most effective, safest and best way to firm, tone and lift our facial skin getting that tight younger looking complexion. When Face Muscles Sag So To Does The Skin And Wrinkles, Double Chin and Loose Jowls Set In! Men and women exercise almost every other part of the body and our face is no different these muscles need exercised too! Face exercises do the same for our face as body exercise does for our body muscles; building strength and firmness providing support. Facial exercises are not only for mature people to achieve a youthful, young anti-aging face, but for young people helping to maintain their youthful looks and to help create a more chiseled and sculpted face . Facial Exercises Do Not Create Wrinkles! Are You Concerned Facial Exercises Create Wrinkles? Don’t be! They actually help make women and men look younger for longer! You are toning your face muscles not wrinkling your skin. The wrinkles within our skin, is due to loss of firmness in our neck and face muscles creating facial wrinkles. Once you firm and strengthen your face muscles, the wrinkles and sagging will diminish as your face firms and the muscles become strong, tight and chiseled, toning and plumping your face back to a more youthful sculpted state. If you really want that younger looking face, there is no better way to get it than by exercising your facial muscles. Grant it, it will take more effort than opting for surgery, but you get real results that actually work, for a real face lift that lasts, naturally and safely. There is an art to face fitness and, my favorite from my extensive research on the anatomy of the face, is the Ultimate Face Transformation, created by Face Fitness Center. It is so versatile with such a wide range of exercises that there is even exercises for chubby faces or people with face fat. The physiology of the face and neck are basically the same for both men and women so, facial exercises promote smooth and wrinkle free skin for both genders; achieving a natural anti aging face lift, for a younger, and smoother face. The best part is you will have this tool for a life time and can do your face exercises anytime. Tired Of Your Saggy Face With Too Many Wrinkles And Droopy Jawline That is Making You Looking Old? Learn the method that Top Models, Singers and Celebrities are using to lift eyebrows, improve droopy eyelids, firm up jaw line and overall face lifting, click the link above. The lines, wrinkles, folds, eye bags, droopy jaw line, double chins and baggy neck skin are caused by the supportive muscles in your face losing firmness and going soft; not supporting the skin any more. The facial muscles connect to both the skin and the bone, and give the support our skin needs to stay firm and lifted. When these supporting muscles become flat from loss of firmness and strength; our skin follows! Facial exercises not only benefit these supporting muscles, but also improve the skin with increased blood flow that brings nutrition and removes toxins from our skin, encouraging our skin to produce naturally rejuvenating oils, creating better skin tone. Toning and tightening our facial muscles, makes us look younger by simply lifting and strengthening our muscles. Face exercises work so well in firming and lifting our skin because the muscles are directly connected to our skin; our skins support system! Exercises for the muscles of the face and neck if done correctly, will greatly improve the look of your face. Firming facial muscles for a man or woman will take some time and effort, maybe even months; depends on how loose and slack your muscles are and, your dedication to getting your best sculpted face and strong chiseled jaw line for your younger looking face. Facial exercises are not for men and women who want instant results, like from a face lift surgery or injecting Botox, but for those who want lasting results for a lifetime. Tightening and toning our facial muscles give us back that younger looking face. By exercising your face and neck you can have a face lift without surgery, the best and natural way to a face lift! Get started on achieving your younger looking face! The Ultimate Face Transformation Exercise Program. "My Face fat was standing between me and my success..."
I now look and feel my face structure and jawline more defined! I would like to thank John and his fitness formula for the amazing help it gave me in my job career, as a professional sunglasses model. I had to compete between thousands of perfect face models, and that face fat was standing between me and my success. 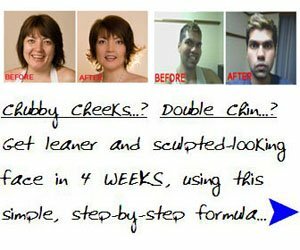 A REAL step-by-step formula that gets rid of face fat, chubby cheeks and chin. I found the right exercises to get my chiseled face through a step by step formula to get rid of face fat and chubby cheeks. The great thing is that this approach can actually get rid of double chin too.